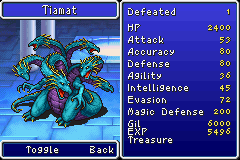 Now that Kraken has been defeated and we have both the Cube and the Rosetta Stone, it’s time to finally open up the home of the fourth and final Fiend, Tiamat! First, we need to take the Rosetta Stone to Dr. Unne. If you like talking to NPC’s, then chances are you remember this guy from Melmond when we were stopping the Earth from rotting. Hope in your airship and head for the city west of Mount Duergar. Once in Melmond, proceed to the northeast corner. You should be able to recognize Dr. Unne easily as he has a unique character sprite. He’ll be delighted that you have the Rosetta Stone and will use it to finish his translation of the Lufenian language. It just so happens that the next place we are headed is populated by people who speak Lufenian, so consider it a blessing when Dr. Unne decides to share his knowledge with you. Dr. Unne is playing the pronoun game. Now I have to ask what “THAT” is. 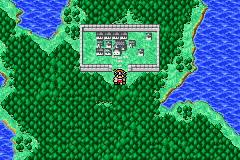 After learning Lufenian, it is time to head to the village of Lufenia. South of Gaia is a lake, and to the west of this lake, right next to the mountains, is the only place where you can land your airship and be able to reach Lufenia. Once you land, follow the peninsula to the south. Lufenia is a rather large city, so you shouldn’t miss it. Our main target in the city of Lufenia is the man directly east of the entrance. Unfortunately, you have to walk in a large, clockwise circle to reach him. You’ll know you’ve found the right person when you talk to someone and they give you the Chime. 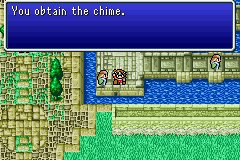 The Chime is the last artifact needed to reach the Air Orb! Perhaps if they kept their yard mowed, they’d get visitors from time to time. Revives one ally and fully restores HP. Blasts all foes with light and heat. While in Lufenia, you will want to stop by the magic shops. They contain what are largely considered to be the best Level 8 magic spells, Flare and Full-Life. Be prepared for some sticker shock, though, as each spell will set you back 40,000 Gil! Return to your airship. If you need any healing or items, now is the time to go and get them. This isn’t a point of no return, but you will be far away from creature comforts for quite some time. Once you are prepared for the long journey, head just south of where you landed to reach Lufenia. You should see a single patch of grass next to a vast desert. Land the airship there and start hiking to the west. You should see the Mirage Tower before too long. 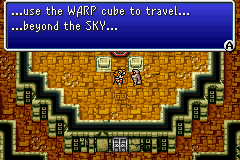 The Mirage Tower isn’t a complicated dungeon by any means, but it can be tedious. You start in the south and must proceed counter-clockwise to reach your destination. It’s hard to get lost, but if you do, the above maps will be useful. The most interesting thing to note about the Mirage Tower is that you will be fighting groups of Vampires. You may remember them from the Earth Cave, but now that you have leveled up quite a bit, they shouldn’t pose much of a problem. In fact, due to the large amount of experience they give, you may even look forward to fighting them! Keep on circling the Mirage Tower and climbing staircases until you reach the third floor. 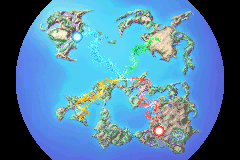 Here you will find a teleporter that will take you the Flying Fortress, the home of Tiamat. Be careful, as the tile right before the teleporter has a laired Blue Dragon. He’s not tough by any means, so slay him, step on the teleporter, and proudly exclaim to the world “Beam me up Scotty”! I love when bosses from earlier in the game become standard encounters later on. After you hit the teleport, you will notice a nice change of scenery. Unlike the Sunken Shrine, the Flying Fortress is made up of much smaller maps and is much easier to navigate. There are no enemies that should cause much trouble (until floor 5) so take your time and collect all the treasure chests. There are several important items here that you don’t want to miss. The first item of interest is the Adamantite, which will allow us to create one of the strongest weapons in the game. Also of interest are the Black and White Robes, which are the Black and White Wizard’s strongest armors, and the Sasuke’s Blade, which is a strong weapon for a Ninja. 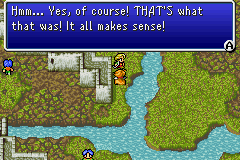 Finally, there is the legendary Ribbon, which has found its way into nearly every version of Final Fantasy. While the ribbon is equipped you will be immune to all status effects and instant death attacks. The sky seems to be mostly below us. The most dangerous aspect of the battle with WarMech is his “Nuke” spell. It hits every party member for an average of 350 hp apiece. His normal attacks hit for 150 – 300. The best advice I can give is to haste your Master (or other frontline fighter) and pound away. It would probably be wise to cease all attacks on the round after a Nuke strike and concentrate on healing, then resume your attack in the next round. If you’re looking to obtain the Genji Armor, note that it only has a 1/20 drop rate. 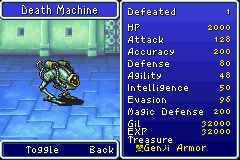 Given the encounter rate of Death Machine is 1/64 (and if my math is right), this means it would take 1280 encounters on average to have the armor drop. You have been warned. Whether you decided to battle WarMech or not, it is now time to proceed to the north end of the bridge and battle Tiamat. 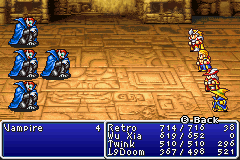 Take heart, though, as the battle with Tiamat is much easier than the WarMech battle was. This brings up another point; By now you may be noticing that Black Wizards are being outclassed when it comes to single-target damage. They do, however, have the highest intelligence stat of all classes. This makes them the ideal hero for using the various items that cast Heal. After Tiamat has been defeated, the final Orb will be lit and the path to the Final Showdown will be open!